Water or Milk for Your Cat? Which is Best for your Cat? or milk, healthy cats drink water." What Should You Give Your Cat? Water or Milk? 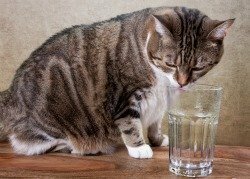 Water or milk for your healthy cat? The short answer is water. 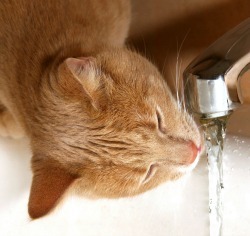 Always have plenty of fresh water available for your cat to drink. This is especially important if you feed your cat dry food. Cats who eat wet food will require less water, but you should always have it available for your feline friends no matter what type of food you feed your healthy cat. In fact, unless your veterinarian says otherwise, you should not give your cat any milk. It is not essential for your healthy cat and can even be harmful to your kitty; many cats cannot digest the lactose in the cow's milk (yes, even cats can be "lactose intolerant"). For the best health, rinse your cat's water bowl every day; especially if your kitty is one who dips his or her paw into the bowl. If you use soap, be sure to rinse the bowl thoroughly. Many cats and kittens seem to prefer to get their fresh drink from an actual glass! If this is something your feline companion likes, you may want to place a unique glass at his or her eating spot so he or she will know that this particular glass belongs to him or her. This helps when you want to keep your drink to yourself! Running Water is a Special Treat! running water, but most of us don't have time to provide this luxury for our cats (and it isn't the best environmental conservation tactic to leave the water running!). If your cat prefers a running drink, you can get him or her a "pet fountain." Pet fountains have recirculating pumps so your cat (and other pets) can enjoy a running libation whenever he or she wants. Even though the water is circulating, you should clean and change the fountain every few days to keep it fresh and healthy for your cat. Choosing the Best Cat Food - How to choose the right cat food for your healthy cat or kitten.